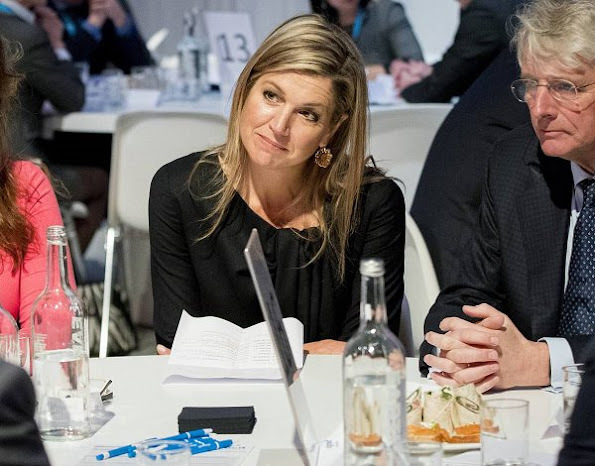 On January 23, 2017, Queen Maxima of The Netherlands attended the Annual Event of NL Groeit (Jaarevent van nlgroeit) in The Hague, The Netherlands. Dutch Queen Maxima wore Natan Coat and Dress. Good looking ensemble, but the hair ruin everything. I agree about the hair. The elaborate neck of the dress would look better with an up-do. But the dress has so many folds that it's hard to tell where the draping ends and the creasing/wrinkling starts. The velvet on the coat looks strange; first the colour (black? brown?) and also the cape effect. No, the outfit does absolutely nothing for her. I love the Queen's capes, but keep the dress simple. The coat would have looked much nicer worn as a coat, rather than draped over the shoulders as a cloak. Maxima seems to favour wearing brown and grey together and I have to admit both colours suit her, but I would have preferred that the coat be worn as a coat than a cloak (it does look nicer on the model). As for Maxima's hair, unfortunately she has very thin hair. Her hair does look nice taken up or even worn in a pony tail and considering the bulk of the collar on the coat an "up do" of some sort would have suited this ensemble better in my opinion, otherwise I like the outfit as her make up and accessories look nice.